Coffee, Rooted Grounds Coffee Co.
For many, particularly in college, those words couldn’t ring more true. Coffee is an important ingredient in the college scene and, as such, requires the utmost care and attention. So, last week, Miami University dining services, representatives from the Miami University Associated Student Government and a social media person made the 50-minute drive to Rooted Grounds Coffee Co. to talk coffee, learn about the roasting process and begin development on an exclusive Miami coffee blend. 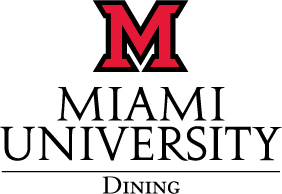 Rooted Grounds has deep roots to the love and honor of Miami University. Founded in 2016 by Miami Mergers David and Patsy Knopf, Rooted Grounds sets out to make locally roasted, fresh, small batch craft coffee available beyond the coffee shop setting. Their dedication to their craft was put on display during our visit. Working with high-quality ingredients and a wealth of knowledge at their disposal, Rooted Grounds walked us through a sampling. As a group, we ranked a handful of coffees, each of which offering unique flavor profiles. While Rooted Grounds took the results and set up a second round of sampling, we were taken around the facility where we learned about the roasting process and about the science that goes into each step of production. We roasted our own coffee beans, left them to cool and went back to sample three blends, made using our results from earlier. As we ranked our new favorites, the Rooted Grounds team explained the nuances of the coffee beans we tasted. We learned more about Brazilian, Sumatran, Guatemalan and Colombian coffee varieties and how factors like soil, climate, geography, harvesting methods, and more impact flavor. Meanwhile, our rankings from the second sampling were tallied. We discussed the results, having chosen our favorite blend of the three, before returning to the coffee beans we roasted, to get a hands-on look at the result of our demonstration. Shortly after that, we returned to Oxford, plenty caffeinated. The entire experience was interesting and informative. We made the trip, not to merely satisfy our own curiosity, but to learn more about a local business whose coffee is expected to be served at various campus locations and to ensure that our guests receive the very best coffee! While we would love to share our winning blend, we think it best to leave the final say to our patrons, so we are planning a sampling where Miami will choose the Rooted Grounds Miami blend! Keep tabs on our social media so you don’t miss out on that or any other information relating to our dining services and Rooted Grounds Coffee Co.! Like Rooted Grounds Coffee Co. on Facebook and check out photos from our visit here!